There’s apparently a pig’s cheek pie on the menu at Tom Kerridge’s new restaurant at the Corinthia Hotel in London. Sadly, this isn’t it. I haven’t been there and judging by the prices quoted in a recent review (£33 for fish and about 12 chips) I probably can’t afford it. But I really liked the idea, so I made my own. I am not daft enough to suggest that this pie bears any resemblance to one created by a Michelin starred chef (Tom’s comes with raw cream mash, crispy black pudding and a devilled sauce, yum) but it’s pretty good. I love pig’s cheeks, they are cheap, they have a fabulous flavour and texture and assuming you’re eating a pig that’s had a bit of outdoor exercise and good things to chomp on, are perfectly suited to slow cooking. Although the filling is lip-smackingly good, it’s the suet crust that makes this pie outstanding. Please give it a try. It’s not in the least stodgy, quite the opposite, it’s beautifully crisp. If you don’t eat pork, the suet pastry would work just as well with beef. The self-raising flour gives it extra rise but it does mean you need to use it more or less straight away because the baking powder in the flour will start working as soon as water is added. You can pre-make the filling and even freeze it until needed, but make the pastry the day you want to bake. Those people who don’t consider a pie is a pie unless it has a top AND a bottom (and I sympathise but a suet base would go soggy) can either use shortcrust throughout or a shortcrust base and suet top. The quantities given here are enough for a top crust on a large pie. Pre-heat the oven to 160C/350F/Gas Mark 4. Cut the pigs’ cheeks into bite-sized chunks, removing any silvery membrane. Heat 2 tbsp oil in a deep casserole, one which will go on the hob and in the oven. Brown the meat in batches and set aside. Add more oil to the pan if necessary and gently fry the onions and celery, adding a pinch of salt to get them to give up their water, until soft and golden. Add the garlic and cook for a few minutes more. Put the meat back in the pan, together with any juices. Add the flour, mix well and cook off for a few minutes, then gradually stir in the cider. Let it bubble up, then add just enough chicken stock to cover the meat. 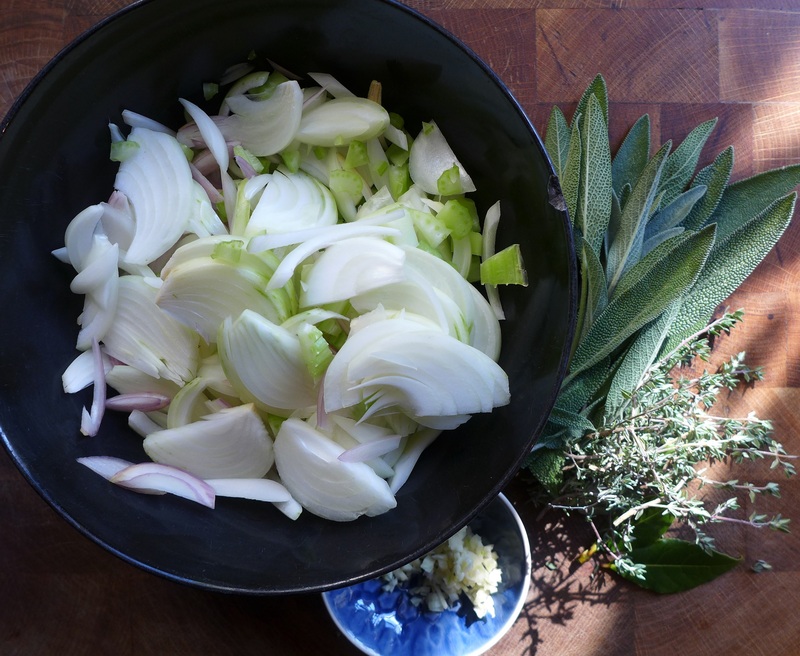 Stir in the herbs and season with salt and pepper. Bring the the boil, cover tightly and cook in the oven for 1 1/2 to 2 1/2 hours, or until the pork is tender. Check and stir at roughly the halfway point. Once cooked, remove from the oven, check the seasoning and thicken the sauce further if necessary. A classier cook would use beurre manié, I use cornflour mix with a little cold water. Allow the filling to cool. To make the pastry, mix together the flour, salt and suet in a large bowl. Gradually add about 125 ml of the water and mix with your hand (one hand is advisable, keeps the other clean!) until the dough comes together. Add a little more water if it’s too dry. Don’t overwork it, it should be soft but not sticky. Form it into a disc, wrap and chill for 20 minutes. Pre-heat the oven to 200C/400F/Gas Mark 6. Put the filling into a pie dish, reserving any excess sauce to use as a gravy. On a lightly floured board, roll out the pastry 1/2 cm thick, brush the edge of the dish with a little beaten egg and cover with the pastry. Use any off-cuts to decorate the top, brush with egg and make a small hole for the steam to escape, or use a pie funnel. Bake for 30-35 minutes until the pastry is crisp and golden. 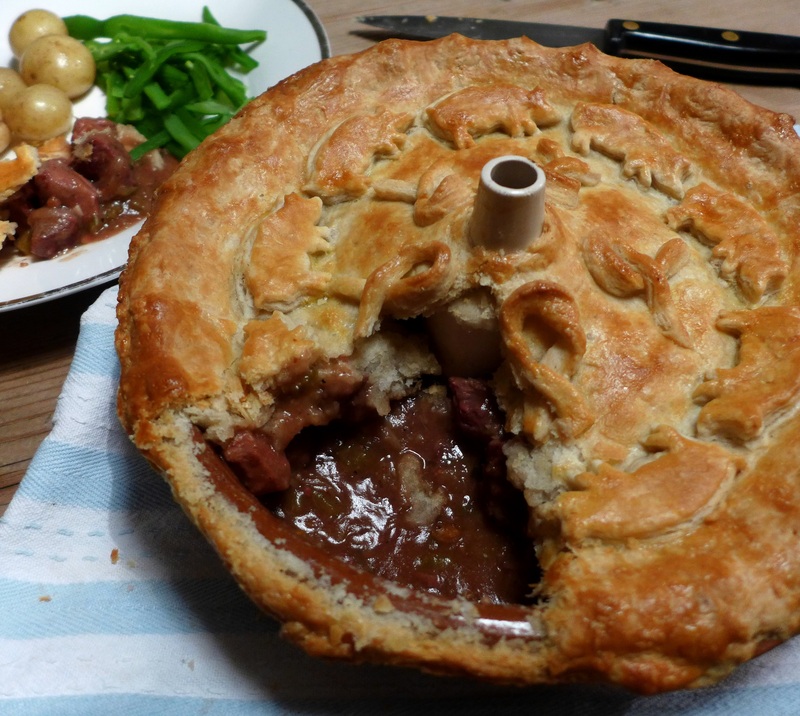 This entry was posted in Mains, Pork, ham and bacon and tagged pigs cheek pie, Pork, suet crust, suet pastry, Tom Kerridge by Linda Duffin. Bookmark the permalink. Good, ’cause I’ve used all mine! Save me some please? Thanks, I was pleased with the way it turned out. This looks sooooo good, Linda. So I’m off down to Tesco’s to find that they don’t have pig’s cheeks, and straight round to the butchers in Stowupland…. Incidentally, fabulous pic of glowering storm clouds over a stubble field. Thanks on both counts, Chris. Hope you find your pigs’ cheeks! Linda, I love the little pigs on top of your pie and I’m sure I’d love the pie. I must ask my butcher to order me some pigs cheeks. I’ve never seen them here at the market or the butcher shop. We’re a very pig loving country, so I’m sure we can get some. Now, I must search for a pig shaped cookie cutter. I can’t wait to make this. A cracker. You have all the ingredients there for a delightful, warming and flavoursome pie. 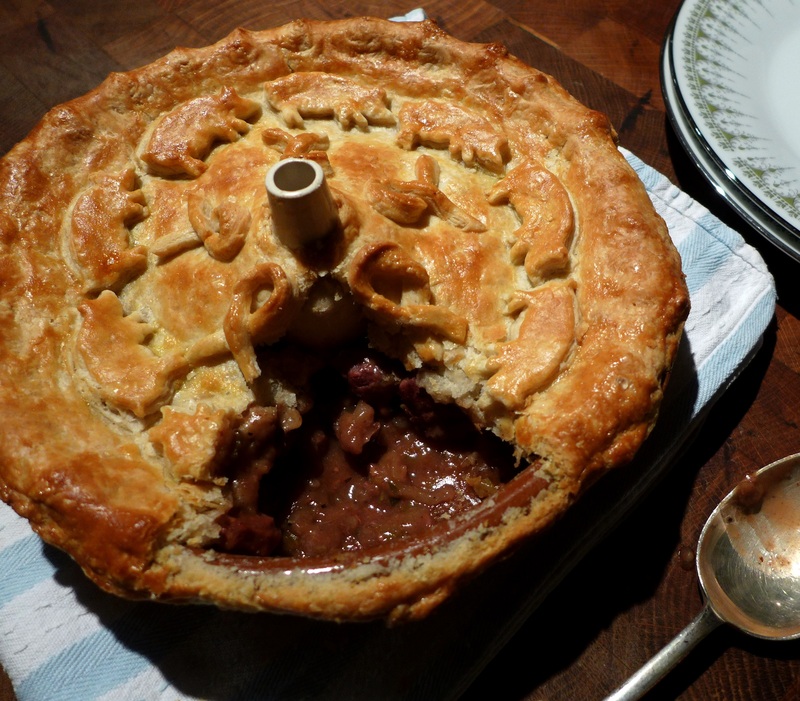 I love to see the lesser cuts getting an outing and this pie is a great way to do it. Keep up the great works. Thank you, Conor, it is a pie to die for (not literally). That crust looks amazing (and not just because of the cute little pigs on top)! I still have a pack of AMKO shredded beef suet lying around in my cupboard and I’ve never even used it (it’s getting pretty close to the expiry date too, so I shouldn’t wait too long). Would that work, or did you use suet from the butcher’s? And in what way is a suet crust different from, say, a crust that uses butter? Thanks, it’s a lovely pastry. I used packet suet but if yours is nearing its sell-by, please be careful as it can go rancid. It is fat, after all, even though it’s treated. A suet pastry is a bit of a game changer, I think. It is very light and crispy, crispier than puff, but with more body. And you get just a hint of squidge underneath if you have a wet filling like this, reminiscent of a suet pudding (in a good way). Thanks, Linda! I’m assuming the suet should smell bad if it’s rancid? Or is there no way to tell until it is too late? Would be a shame to chuck it away if it’s still usable. Well, I made some dumplings without realising and we threw them in the bin! Utterly vile. The sniff test usually works but if in any doubt buy a new packet. Okay, fingers crossed then. I wish I didn’t forget about it for so long :P.
Okay, so update: my suet was still fine. I just made a pie with this crust and you are totally right, it was wonderfully light and flaky! Thanks for the recipe. Oh, any kind of cheeks cook so well even if slowly l . . . shall try ! But by now Australia has a bit of a ‘fixation’ with them and they certainly are in no way ‘cheap’ ! Must echo Ron about the unusual ‘cookie cutter’ . . . . methinks every diner would be enchanted . . .
Really? I expect they’re going the way of pork belly and beef short ribs, a cheap cut that gets taken up by canny chefs and then gets stupidly expensive. Drat it! This sounds and look absolutely amazing, Linda. And I love the idea of pork cheeks, although I’m not sure I’ve ever had them I imagine they’re nice and juicy and full of flavor. Especially braised in cider and baked under a suet crust. Comfort food! Your pastry looks grand! Cheeks are so good. Unfortunately, the restaurant chefs here seem to buy them all up and we seldom see them.